Young Jefe recruits Uzi in the lead up to his new 1017 vs. the World tape. Shy Glizzy shared a new track today, a team up with Lil Uzi Vert, "Fan Club." The song is a slow-rolling banger that begins with a flex that reads halfway like social commentary: Young man pull your pants up/ Sorry I can't help you get your bands up/ I can't understand why they want me in handcuffs. 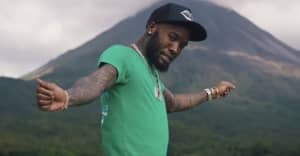 The track comes after a series of new videos from Glizzy from Young Jefe 2, including his Bankroll Fresh tribute "Bankroll," last week. Meanwhile, Lil Uzi's Gucci Mane-assisted 1017 vs. the World tape is apparently on the way shortly.